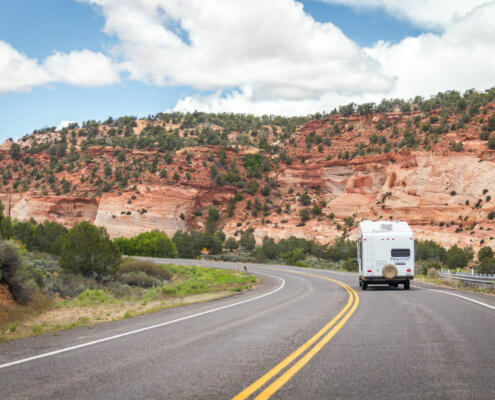 Travel Trailers insurance coverage is significantly different than Auto or motorhome insurance, and can become quite simple. Why because when it comes to travel trailers and fifth wheels, much of the coverage comes from the towing vehicle. For example, the liability, medical payments, PIP, and uninsured and underinsured motorist all come from the towing vehicle. So why is Travel trailer insurance coverage so important? Because of the physical damage and specialty coverage. Damage to the travel trailer – This includes collision and other than collision coverage. Collision – This coverage includes the upset or roll-over of your vehicle and an impact with a non-insured vehicle. Pretty straight forward. Other-than-Collision – This coverage includes 10 specific things, and much more. So, things that are covered under other thank collision include falling objects, fire, theft, Explosion or earthquake, windstorm, vandalism, riot, collision with an animal, and glass breakage. Other-than-Collision coverage isn’t limited to these 10 things, but the insurance companies have said that these 10 things are definitely not-collision. 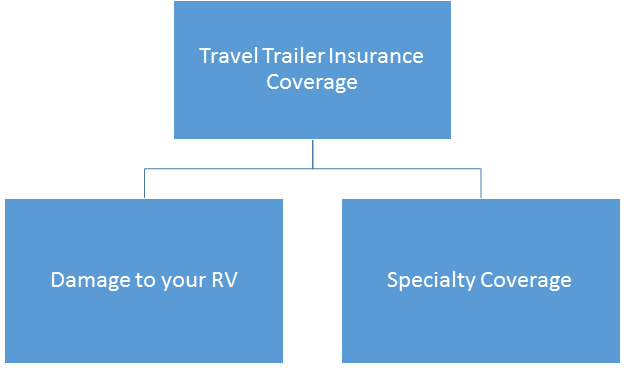 Specialty Coverage – Travel Trailer insurance coverage is more than just physical damage, its the extras that you don’t get without a specialty travel trailer insurance policy. Replacement Cost Personal Effects – Personal effects coverage would include all the stuff you bring with you. Imagine. If you could grab your travel trailer and flip it upside down what would fall out? Besides a bunch of dust and stale Cheetos from your last trip, a lot of valuable stuff. A lot of that stuff, can be covered under personal effects coverage. Personal Effects coverage can cover all these things up to the limit on your policy in the event that then are damaged, destroyed, or stolen. Attached Accessories – Coverage for Attached Accessories, including awnings, satellite dishes and TV antennas. Reimburses you for expenses incurred following an accident or other covered loss. Pays for hotels and transportation if your fifth wheel or travel trailer is incapacitated. Choose the dollar amount for maximum insurance reimbursement. Vacation Liability – So you have just finished, setting up your rig in a camp site, you have just put out your chairs so that you can sit and relax under the awning, when a neighbor, comes over, trips, falls, and breaks an arm. Where are you going to get covered? Vacation Liability. Vacation Liability covers losses resulting in injury, death, or property damage that includes in your motor home or travel trailer, or on your campsite. Full-Timer RV Coverage – Are you living in your travel trailer or 5th Wheel full-time? If you are you will want to purchase Full-Timer liability. This works like the personal liability coverage that is provided by a homeowners policy. Whereas the vacation liability works like premise liability, the Full-Timer Liability is much broader. Some companies will cover medical payments, loss assessment, and even contents in a storage unit. Full-Timer Coverage is designed for those that use their motor home or travel trailer for six or more months out of the year. RV Specific Loss Settlements – From total loss replacement, to purchase price guarantee, to agreed value we have RV specific loss settlements that will protect your RV in the best way possible. There are so many more options as well. Get a quote today and find out what can be included in your travel trailer insurance coverage.